Here's the cover to the comic I just finished.. It's basically done, although I might have to come up with a few filler pages to pad it out since I've only got 20 pages of actual story. Maybe some ad parodies, or see if anyone wants to contribute 1-3 pages. Of course I'm only going to xerox a small number to give to friends and gerbils (there's a surprisingly large contingent of comic book readers among the gerbil population) so I don't know why anyone would contribute, but still. I think, to keep this blog alive, I'll sometimes do a random showcase, highlighting the work of a Salty 'Ham Cartooneesta. So today, let's look at some stuff by Brian Hamner. Brian's primarily a fantasy artist, and not a cartoonist (as far as I know). So why is he a Salty 'Ham Cartooneesta? Well, for the purposes of SHC membership, I have a broad definition of cartoonist. 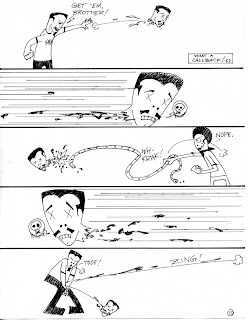 Let's say a cartoonist is someone who uses unrealistic exaggerations and juxtapositions in his or her drawings. So that includes Brian. 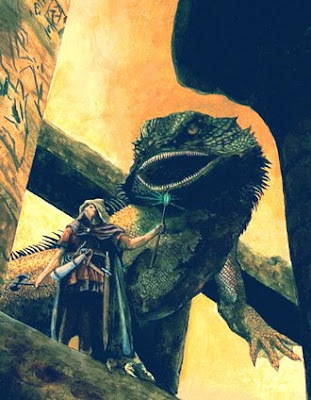 Here's a guy leading his giant horned toad around some old ruins. Cool! And here's a real crazy one. I like this color scheme. All grays, with just a twinge of yellow in the hair, plus BRIGHT blue cables. Or are they tubes? And is she being tortured, or might she be enjoying this arrangement? I guess I'll have to read the book. I like how the wires are neatly coiled up on the left side, there. When hooking a young lady up to a giant machine, we have to be careful not to get our extension cords all tangled up. It's in March. 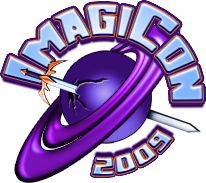 It looks to me like maybe the organizers of Omega Con are hoping to start over and do a better job this time or something. Fason, do you know if that's the deal? Hey, cartooneestas! 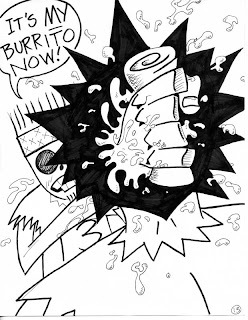 My 24 hr comic "Burrito Fight" is available for reading on Myspace.com/Roskorillist! Go check it out. Guaranteed to leave a stain on yer brain!